I love them. I mean, really love them. They are my go-to meal… my version of grilled cheese. They are comfort food, and are so easy to make! My favorite are Chicken Quesadillas. They are a sure fire hit every time I make them. Easy enough for family night and good enough for company. What’s really great about these is that you can have all of the ingredients made well ahead of time, then it’s easy to do a whole big batch of them, or just one for a single lunch. Take a package of boneless, skinless chicken breasts and go ahead and season them with some garlic salt and fresh cracked pepper. I do it right in the package they came in. Sear the seasoned chicken on both sides. You are just searing, not cooking all the way through. Transfer chicken to a pyrex (hopefully one that is yours) and drizzle with Italian dressing or a balsamic vinaigrette of some kind. You can also use a bit of olive oil and lime juice. Whatever you have on hand is fine. Pop the chicken in a 375 degree oven for about 20 minutes. Do not over-cook! 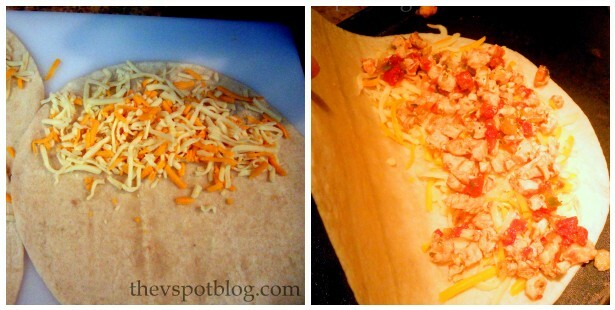 Remove from oven and chop/shred chicken. Heat a bit of oil in a skillet over medium-high heat. Toss in shredded chicken and stir for a minute or two. Add in enough fresh salsa to coat the chicken pieces, cover the skillet and turn off the burner. Just let the chicken sit until you need it. The salsa will sort of “steam” into the chicken. To assemble the quesadilla, spread grated cheese on one side of a burrito sized flour tortilla, then top with the chicken and salsa mixture. Fold over and place on a griddle over medium-high heat. You do not need to oil the griddle. When the tortilla looks crispy and browned, flip it over and cook the other side. Transfer to a cutting board and cut into pieces. I love them with sour cream. Mmmmm. 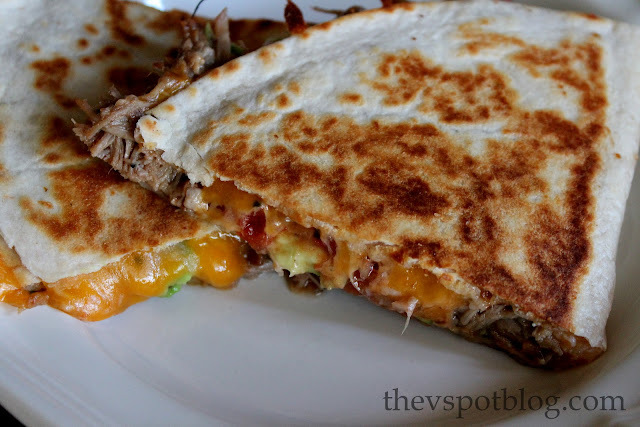 I actually make these with leftover pulled pork (the old slow-cooker with a bottle of root beer technique) add the same salsa over the top, a little mixture of cheddar and mozzarella cheeses and fresh avocado. Oh! And also with sauteed mushrooms, spinach, goat cheese, red onion…. Pretty much anything tastes good, wrapped up in a quesadilla. Check out what’s in your fridge. If you have cheese and a tortilla, chances are good that you have the makings for a delicious quesadilla. Can I hire you to come HERE and make that for me? Yep my mouth is watering !!! lovely. Nice! I do mine using a mojo rotisserie chicken when I’m crunched for time. I haven’t tried them with shredded pork– looks tasty!! Hello? This is weird. I make the exact same thing, and often, and I do the same thing with leftover pulled Pork! I like your variation with the salsa and the chicken. I do something like this for my Chicken Enchiladas. This is my “go-to” appetizer when I have to bring something more substantial than chips and guacamole. Quesadillas were a main stay of my family’s food repertoire growing up. Yummmmm, I might have this tonight instead of our usual Taco Tuesday. While we are on the subject, (and food is my favorite subject), I like my quesadillas smothered in guacamole. We are Quesadilla lovers over here too. Sad as it is, I rarely use chicken though. We usually throw in a bunch of leftovers! YUM! I’ll be right over! my fav thing to eat! you can double your production by cooking the entire tortilla flat and covering completely with another on top of the fillings (vs folding it over). know what i mean? takes some practice to flip but CAN BE DONE! 🙂 i need to try apple and caramelized onions… sounds heavenly! Oh we love quesadillas at our house!! And with the fresh avocado it just makes me so happy. 🙂 Thanks for sharing your versions! At the risk of offending-do you know any kinds of low-fat cheeses’ to put in it? Are there any? 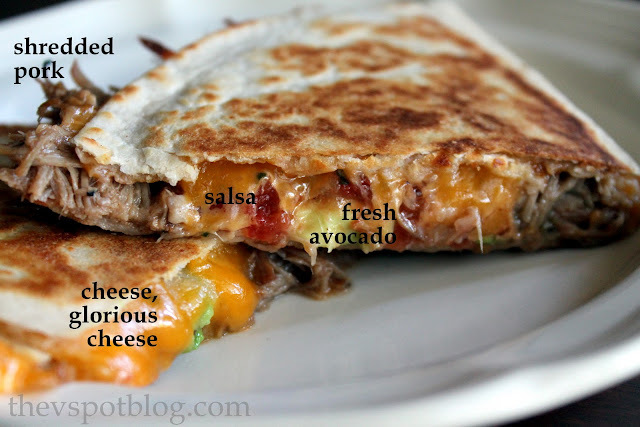 Cheese has so many calories (That’s why it tastes so good)But I love quesadillas and the hubby does too. Thanks! Oh yum!! I am ready to eat now!! I want to come over right now…and have these on the table. I have all of that in the fridge and I’m hungry….perfect! they are my go to as well.. except i use a can of rotel instead of the salsa.. then throw sour cream and salsa on top.. oh my word.. i want them. now. Seriously? My mouth is watering profusely. These look soooo good!!! Yum! I am going to put tortillas on my shopping list RIGHT NOW. I’ve pinned this, too.